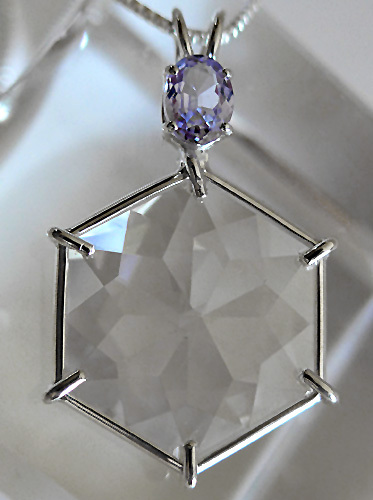 Dimensions (HxWxD): 1.5" x 0.8" x 0.25"
This beautiful water clear Flower of Life quartz crystal pendant is crowned by a brilliant, highly faceted oval violet spinel gemstone. 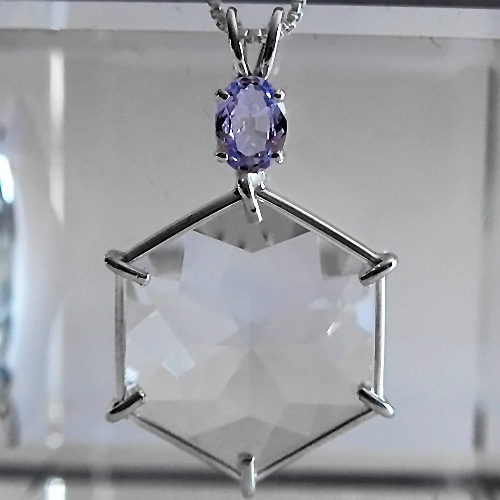 The Flower of LIfe is a unique flower-like 12 pointed star in a sterling silver setting which shows its luminous quality and allows the stone to breathe. It is on a simple sterling silver chain which allows it to hang freely right at the thymus between the throat and the heart chakras, and comes complete in its own velvet jewelry box. The Flower of Life is a wonderful tool for personal growth on one's spiritual path. The 12 pointed star is "associated with Christ Consciousness and the restoration of Divine Order. It is an evolutionary tool for those who wish to reclaim the purity and grace of their soul, as it was originally created. The Flower of Life places one within the center of abundant nurturing energy of the Universe." In the words of Drunvalo Melchizedek, a modern Master of sacred geometry, "The Flower of Life symbol is considered to be sacred among many cultures around the world, both ancient and modern. Within this symbol can be found all the building blocks of the universe that we call the Platonic Solids. "The symbol can be used as a metaphor to illustrate the connectedness of all life and spirit within the universe. The Platonic Solids are important because they are found in the rudimentary construction of organic life, as well as music, language, and consciousness itself." "In the Flower of Life workshop we show how these building blocks of life called the Platonic Solids serve as templates through which the foundation of all life everywhere can be expressed. Once this is understood, the importance of the Flower of Life becomes apparent as a totally integrated expression of 'God' or 'All That Is.'" This pendant comes with a simple sterling silver chain which will sit upon the heart chakra, where it will be of most beneficial resonance. You can see a better shot of the beautiful facets of the flower of life cut below. Note: Weight above is shipping weight. Actual weight of this pendant is .28 oz.